Let your GTM strategy lead the way! What will your teams roles and responsibilities be? What kind of governance do you need? Should there be a roll-out plan? What should I prioritize first? These are just some of the factors you should be thinking about, and having a plan will help you tackle this in a systematic and logical way. 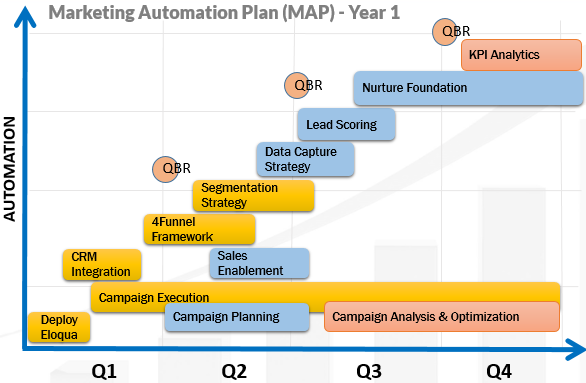 What is the Marketing Automation Plan (MAP)? 4Thought Marketing automation experts learn about your marketing strategy, organizational structure, targets, current technology landscape, pain points, and current Marketing Automation usage to make strategic recommendations. The resulting Marketing Automation Plan (MAP) will be designed to align to your corporate and departmental initiatives, and raise your level of sophistication.